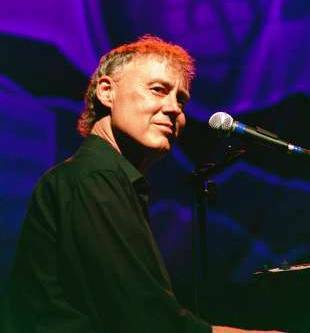 Bruce Hornsby is an American treasure who continues to be more than obliging when it comes to giving the people what they want. From 1980’s pop star to worrying some folks at a nearby outdoor venue in 2013 regarding this show drawing “too many Hippies”, his career achievements stretch far and wide. The collaborations over 30 years are truly impressive, varied and extensive with prime examples being Don Henley, Bonnie Raitt, Ricky Skaggs, the Grateful Dead, Steve Kimock and a brush with being sampled by Tupac Shakur. Whichever way your pleasures tend, expect a night with Bruce Hornsby to feature songs popular enough to win a Grammy, funky enough to make folks drip sweat, more improvisational and spacey than you may imagine and also a display of marvelous classical piano technique. Never associated Bruce Hornsby with funk and spacey improvisation? It is time to start. On this night of the Noise of the Earth Tour, Bruce Hornsby and the Noisemakers had the Orange Peel’s crowd singing and the floor swaying. Early on Hornsby shared with the crowd that despite a wonderful show at a nearby outdoor venue a couple summers ago, this time around someone with the nearby outdoor venue had qualms about the type of crowd Bruce’s show might draw. The type of crowd attracted to the nearby outdoor venue for that show was predominantly middle age, kept their voices quiet for private conversations, had enough money in their pockets to keep the concession stand hopping PLUS practiced what they preach by picking up after themselves in order to keep the scene clean. Seems like any venue’s dream crowd. Bruce acknowledged the heat and humidity in the Peel during the evening’s jovial back and forth with the audience but assured the attendees that he and the Noisemakers would be certain their music would not cool down the Orange Peel. Keeping things hot and happening is easy to do with a catalog of music to choose from that includes such songs as Just The Way It Is, Look Out Any Window, Long Valley Road, Mandolin Rain, Every Little Kiss, Mighty Rainbow not to mention Hornsby’s working knowledge of the Grateful Dead. An acoustic set with Hornsby playing a dulcimer and his percussionist, Sonny Emery, working the scrub board was a pleasant surprise. Much like his songs from the 80s, this acoustic set and the entire evening provided some lucky several hundred too Hippie-ish for the nearby outdoor venue folks, a night of music to keep time by. With August 9th being what it is, summer’s end drawing near and a reminder of the path that is for your steps alone, Black Muddy River and He’s Gone gave everyone an opportunity to include Jerry in the evening. With a quick story leading into The End Of The Innocence>>>Color My World>>>The End of the Innocence, Bruce let everyone know that The End Of The Innocence was a song that Jerry enjoyed. To get a fine example of Bruce Hornsby’s relationship with Jerry and the Grateful Dead, check out the RFK show from the Summer of 1991.